10 children’s holiday books, from timeless reads to newer classics. How exactly does Santa keep tabs on who’s naughty and who’s nice? Turns out he’s got a mole–the elf on the shelf–who comes packaged with a companion book. The elf mysteriously changes locations overnight, and kids love looking for him as soon as they wake up in the morning. Bonus for parents: Since the elf’s always watching, you should be able to milk major good behavior out of your kids. We all know the magical, evocative words of Clement C. Moore’s traditional holiday poem. This gorgeously illustrated version, which uses collage papers and oil paints, adds a modern twist: Santa wears funky pants, sports dreadlocks and leaves the children traditional African gifts. Nancy’s psyched about the holidays until her ultra-fancy tree topper breaks. Can the ultimate girly-girl learn to love plain old DIY tree decorations? As always, the detailed, sparkly illustrations make this a fave among the princess set. 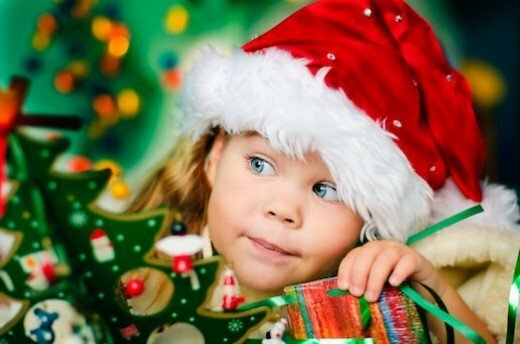 Does your kid have a case of the holiday gimmes? Brother and Sister Bear do too, until they learn what Christmas is really all about. This holiday-themed book in the series begun in 1962 ends with everyone learning a very important lesson, just like always. Remember this one from when you were a kid? Older children will love this 1972 classic, in which the six misbehaving Herdman kids — the “worst kids in the entire history of the world” — take over the church pageant and reinterpret the story of Christmas. The mix of outrageous moments, hilarious hijinks and profound surprises makes this one read parents will love as much as kids. Lovers of Eric Carle’s classic The Very Hungry Caterpillar will recognize the same iconic collage illustrations in this wintry tale about a farmer who dreams about a white Christmas. Like Caterpillar, the pages hold extra interest for young readers, with cutouts and counting. Brer Rabbit meets African tradition in this tale of a rabbit looking for something special to give his sick grandmother for Karamu, the Kwanzaa feast. What would Christmas be without the Grinch? Kids love the dastardly character, who plots to cancel the holiday, only to find it happens anyway, even without the presents. Grinch-loving kiddos will go for the animated and live-action movie versions too. The plucky piglet gets her house ready for Christmas, “helping” her parents in the most unhelpful ways possible. The charming black and white illustrations–punctuated with green and red accents for the holidays — play off the spare words to tell the whole story. The sweet stuffed bear in overalls offers toddlers an introduction to the traditions of Hanukkah, from lighting the menorah and hunting for gelt to playing dreidel.